Last year I started an effort to share a quote a day, each from a woman writer I admired. Let’s just say it was a rough year, and life intervened as it sometimes does. So I’m going to try this again, not every day, but often enough. 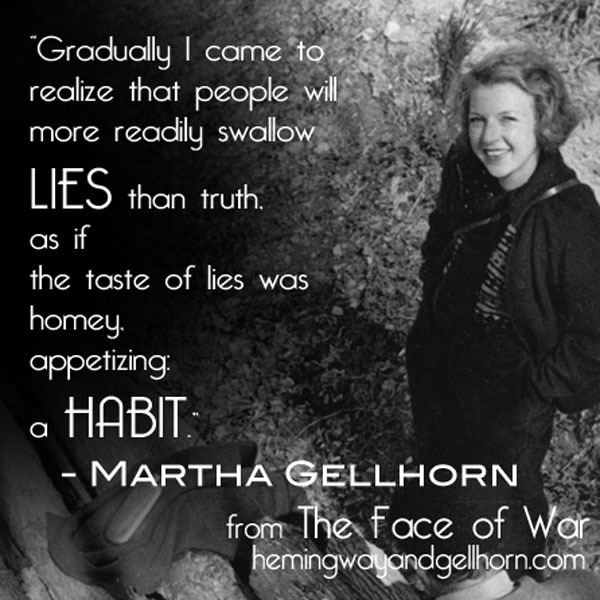 I want to start with a quote from one of my own heroes, novelist and war journalist Martha Gellhorn. Many of you will recognize her name from the epigraph and author’s note on The Race for Paris. Martha was a big inspiration for that novel, about two journalists who, having been denied access to press camps and the front, join forces with a military photographer and race toward Paris. They hope to be the first to record its liberation from the Nazis, and thereby make history. I have a new novel coming out this summer, which is directly about Martha Gellhorn herself, focusing on the time when she becomes a war journalist, which coincides with her wild love affair with Ernest Hemingway. (Yes, that Hemingway.) It’s titled Beautiful Exiles, so please watch for it! So you might be seeing a bit from her here in the days to come. I’ve done this one–written by her decades ago but sadly relevant today–in a graphic. Feel free to share if you’d like.